Anyways… Tucki is not much higher than the road, and only a few miles distant, but the terrain in between is rather frustrating. 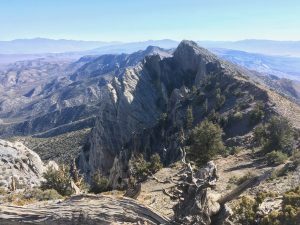 The spine of the Panamints is an indistinct, undulating ridge, with deep valleys descending to either side. Alternatively, it is a series of east-west ridges with saddles between them, and the best path follows these saddles. Either way you look at it, there is a lot of up-and-down through pathless desert terrain. The initial drop is the most discouraging, descending nearly 1000 feet to a 4×4 road coming up from Emigrant Wash. I dropped into a ravine near the end of the closed road, and soon found the bits of old trail mentioned in Bob’s report. Once out in the broad valley, I found the terrain surprisingly runnable, and even fun, requiring constant attention not to trip on a cactus or bury a foot in the colonial burrows of some unknown desert creature. I continued straight across the road and up a reddish wash, finding a couple cairns along the way. I scrambled a couple of short class 2-3 steps in the wash, then left it where it turned east to climb over the next ridge. I found yet another demotivating drop, this one somewhat steep and loose. 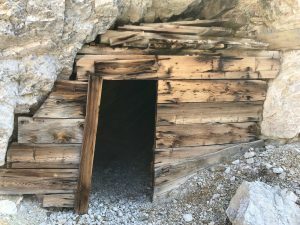 There was an old cabin on the other side, but it was well west of the route I had downloaded, and I wanted to make it back before dark, so I didn’t make the 15-minute detour to check it out. Instead, I climbed another gully and slope, followed the meandering crest of the range, then made another drop. I found a completely unnecessary class 4 step getting out of this one, which was a nice change of pace. Beyond, it was more of the same rolling terrain, ending with several false summits. Tucki being neither easy nor notable, the register was almost entirely a collection of the usual suspects. 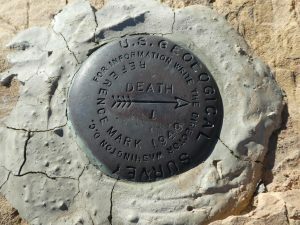 I read through it while eating a bar, photographed the ominous “DEATH --->” marker, then began the long hike/jog back. Rather than going over the ridge into the red gully, I followed the road around to the east, which was longer but easier and more runnable, and probably took about the same time. I followed the wrong gully back up toward the road, but it didn’t make much difference, and I was happy to make it back to the car well before dark. 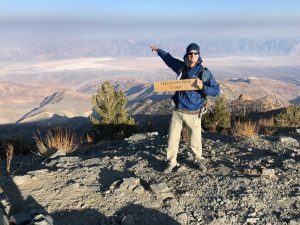 Telescope Peak is the highpoint of the Panamint Range, rising over 11,000 feet from Death Valley to the east, and slightly less from the Panamint Valley to the west. 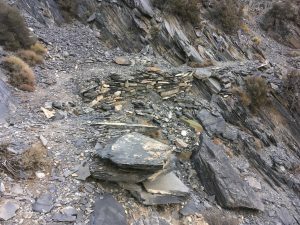 Most people hike it from the northwest, via a well-maintained trail starting above the charcoal kilns. However, there is a harder way to climb it, starting from Badwater to the east, that is popular among Californian peak-bagging masochists. Since I am all of that except Californian, I have had it on my to-do list for awhile, but have never quite summoned the motivation at the right time. Now was my opportunity. There are several ways to do it, the most popular being to start and end at Shorty’s Well on the west side of the valley, as Brett Maune did for his mind-blowing 8-hour run. 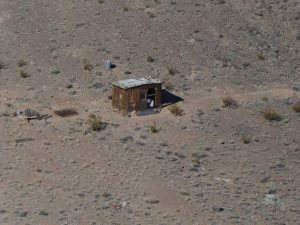 However this is not technically the lowest spot in the United States, and Shannon, displaying admirable purism, insisted upon starting at Badwater, 30 feet lower and six miles east of Shorty’s Wells across a salt flat. I had originally wanted to return to the start, but was fortunately persuaded to set up a car shuttle to the normal trailhead. With the shuttle, it was about 30 miles and 12,000 feet of gain, much of it over rough terrain, and a long day; without, it would have been a nightmare. I had planned a 4:00 wake-up and 4:30 departure. However, there was a surprising amount of nighttime traffic at the “day use only” parking lot, so I got little sleep. Topping it off, a noisily enthusiastic group pulled in at 3:00 AM, and spent the next 15 minutes loudly sorting gear, enthusing about burritos, and probably fist-bumping. What were the odds that we would share the route with another group, and that they would be so annoying? There was no chance of getting back to sleep, but we still managed to take forever getting our act together, starting at the originally-planned 4:30. The night-time crossing of the salt flat was probably the day’s crux. 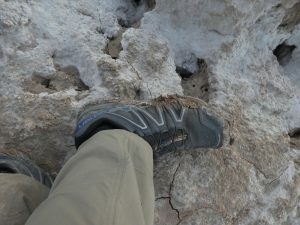 We were fortunate that it was mostly dry, as it can become nightmare mud, which the salt crust prevents from drying. The dry parts of the flat were some sort of salty and surprisingly hard mud/rock with pockets and sharp points, which sounded like flatware when it broke. It suddenly changed in color and texture for no obvious reason, and always required careful foot placement. With no moon, there was no horizon by which to orient myself. I had read about people wandering in circles in the desert, and it turns out that I am especially bad in this respect. After hiking a bit in what I thought was a straight line, occasionally bumping into Shannon, I looked at my phone and realized that I naturally turn left at a radius of about 0.1 miles. I had no idea I was so defective. Fortunately we had started relatively late, giving us a horizon to orient ourselves for the second half of the crossing. 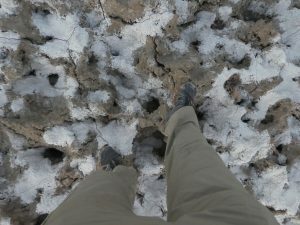 As we approached the west side of the flat, we encountered a mild version of the dreaded mud, sticky and perhaps an inch deep under a breakable crust. Once past the salt flat, it was a short and mildly brushy hike to the well-graded West Side Road, which leads to the much rougher Hanaupah Canyon road. 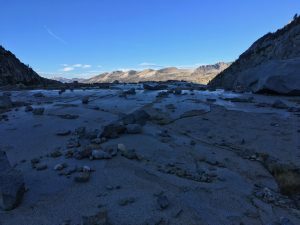 This road climbs the endless alluvial fan to the canyon’s mouth, then drops into the wash to make its way up the south fork toward a year-round spring. Badwater to Telescope hikers normally count on this spring to refill at the base of the main climb. 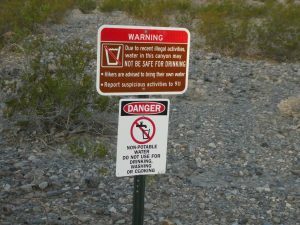 However, a sign at the start of the road stated that unspecified “illegal activities” had made the water “NOT SAFE FOR DRINKING.” Fortunately I am paranoid about desert water sources, so we had both brought enough to skip the spring. Hanaupah Canyon was surprisingly busy. In addition to the large group somewhere ahead, we were passed an older couple in a rented jeep, moving at a slow jog, and saw a half-dozen people at the mouth of the canyon’s north fork, possibly canyoneering. The canyon climbs very slowly, gaining only 3500′ in 8 rough miles to the spring, so we had plenty of time to speculate about illegal activities and why people would drive up this obscure canyon in the rapidly-warming morning. The road disappears below where the map suggests, and we found the jeep there, and the senior couple a short distance upstream. We found occasional cairns or bits of use trail, but the route seemed far less traveled than I had hoped. Nearing the spring, a small running stream with nasty brush to either side forced us along one side or the other of the canyon. I knew the route climbed the right side, but for some reason followed a faint trail on the left. This eventually led to a decent-sized mine, which provided a welcome diversion after the long desert slog. Perhaps the jeep couple were mining enthusiasts? I spotted an old gate across the way, and I think the normal route climbs the ridge just beyond this point, but the brush looked particularly nasty, so we continued upstream on the left, hoping to round the brush above the spring. This little detour did not cost much time or effort, and solved the mystery of the “illegal activity.” Some hardy (in the Dave Barry sense of “stupid”) entrepreneurs had set up a large marijuana field less than a mile from the end of the road, with a hundred or so plants drip-irrigated from the spring. The National Parks Service had snipped the hose from the spring, but left the whole system in place for the next person to come by with a roll of electrical tape and some seeds. In addition to the irrigation system, there was a small camp with a bag of fertilizer and some empty cup-o-noodles packages. Now it was time to climb: 6200′ in 4.5 miles to the trail, then another 1200′ in 1.5 along the trail to the summit. We started up along an old mine road above the grow, then took off cross-country where it ended at a partially-collapsed tunnel. Shannon was a bit skeptical of my route, and I had to admit that it was not a GPS track someone had recorded, but just a line I had made up based on a rough written description. 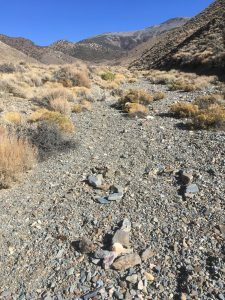 Fortunately almost nothing can grow in Death Valley, so after a bit of steep side-hilling, we found easy travel up a faint rib to the ridge north of the canyon, even passing a couple of useless cairns. There is a trail in places along the ridge, but it seems to serve sheep more than humans, and fades in and out as the possible path narrows and widens. The best route stays near the crest, weaving around trees, crossing minor bumps, and climbing steadily and steeply. We had been expecting to catch the 3:00 party group all day, and finally met one descending as we approached the steep, forested headwall below the north ridge. 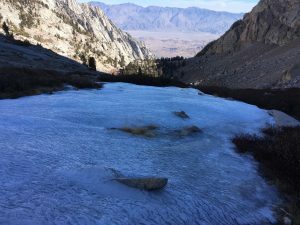 He was planning to descend to the springs and camp, then hike back across the salt flats to a car at Badwater the next morning. I thought “okay, have fun with that,” but Shannon generously offered him a ride from the standard trailhead, convincing him to head back uphill. The young man made good time for awhile in his overnight pack, staying with us and talking long enough to make things clearer. 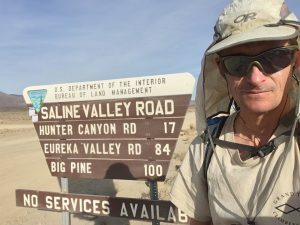 He was one of a group of six, trying to set a record of three days on a 150-mile cross-country route from Badwater to Whitney called “lowest to highest” (explaining the crude metal “L2H” sign we had found earlier). Not liking his chances of completing the 35-mile dry stretch from Hanaupah Springs to the next water source, he had abandoned the attempt. While desert fast-packing is absolutely not my thing, I appreciated the spirit, understood why they were so fast and loud, and was somewhat ashamed of my earlier irritation. 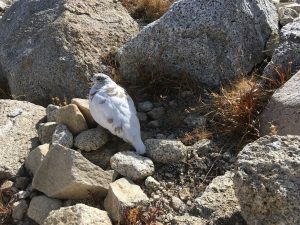 He eventually dropped back, planning to skip the summit and meet us at the trailhead. The last 3000′ are a brutal grind up the east face to the ridge, weaving through trees and brush on mostly loose ground. We got lucky and chose a good path, passing another member of the L2H team who spotted us from a worse line and, mistaking us for two of his group, shouted to go on without him. This was starting to look like a desert version of the Scott Antarctic expedition, with members dropping along the way as ambition met harsh reality. After hours of calf-burning climbing and backsliding, the well-manicured trail was a pleasant relief, though I soon tired of the horizontal switchbacks. As expected, there were several groups of hikers out on this perfect holiday weekend, amusingly (to me) including some fans (not mine). It had been t-shirt weather almost the whole way up, but was suddenly chilly and windy on the summit. There was a group with a friendly dog on the summit, who were a mixture of impressed and baffled when we explained how we had arrived there. Snacks and silly photos later, it was time to head down: while there would be no evening headlamp, there was still an exhausted 2-hour drive back around to Badwater. We met our young companion just as he was reaching the trail, worried that we might have already passed and left him. He turned out to be a Berkeley student just about to turn 21, making me feel even older than I normally do. I appreciated his enthusiasm, though, and enjoyed our conversation on the way to the car. Two hours’ drive later, we were once again cooking dinner at Badwater in the dark. Not wanting a repeat of the previous night’s disturbances and sleeplessness, we blearily drove to the closest more secluded trailhead to camp. It was still sort of Sierra season, so I could have tagged a few more random SPS peaks out of Horseshoe Meadows. 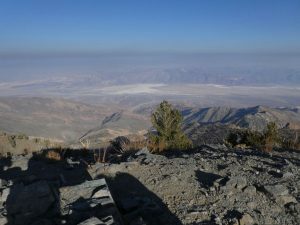 However, Shannon suggested a suffer-fest in Death Valley that had long been on my radar, which seemed more interesting than cold hours in the sand trenches of Horseshoe Meadows. To make the driving more pleasant and productive, I picked out some DPS peaks along the way to fill out the long weekend. 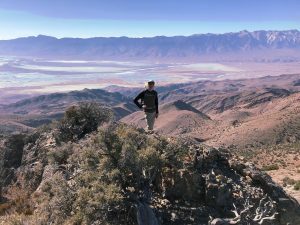 We got a semi-late start on the drive, stopped in Lone Pine to top off our gas tanks, then continued to Keeler to stash my car and bounce up the long, steep, but well-maintained dirt road to Cerro Gordo. This strange settlement is part ghost town, part museum, and part spooky redneck encampment. There were “POSTED No Trespassing” signs everywhere, so we were a bit apprehensive parking in a wide spot just below “downtown.” We asked a couple of guys wandering around if it was okay, but they were just fellow visitors, and had no idea. 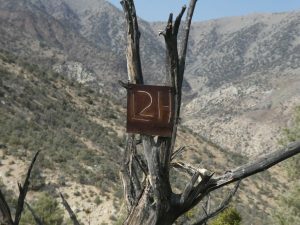 The hike starts out with an easy walk along a road to some antennas, past a gate with yet another trespassing sign, and a couple of primitive cabins with an outhouse, a nice view of the Sierra, and no obvious water supply. From near the road’s end, a faint use trail takes off north along the undulating ridge. 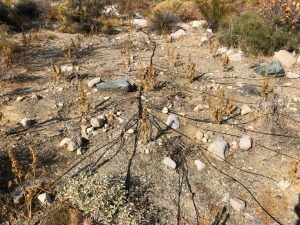 This being a DPS peak, I was counting on there being some sort of trail, though the woody and sometimes spiny desert brush was sparse enough that it was unnecessary. The ridge is mostly easy smooth going, with just a couple of cliffy sections. While the trail drops below, I for some reason decided to stick to the ridge. The views to the east were somewhat better, but getting back to the trail required some third class downclimbing on sticky, chossy limestone. The summit register contained plenty of familiar names, and showed a fair amount of traffic, unsurprising for such an easy peak. We huddled out of the wind for a bit, then retraced our steps back to the car. The remainder of the day, and some of the evening, was spent setting up a car shuttle between Badwater and the charcoal kiln road. I had quickly glanced at a map, but had not calculated just how long this would take; the process turned out to be educational and exhausting. 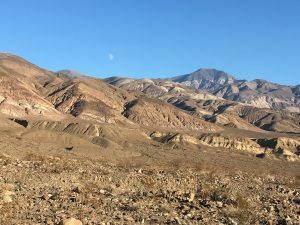 First, I learned that although it looks shorter, the drive south along the Panamint Valley Road and north up Wildrose Canyon is slower than going around from the north, because the southern end of the Wildrose road is rough and infested with man-eating potholes. We were fortunately able to get both cars past the kilns and up the “high clearance 4×4” road to the gate without a surprise oil change, saving some miles. 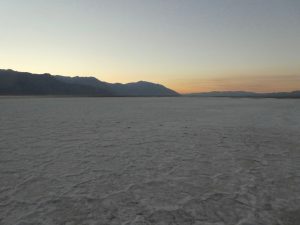 Unfortunately, from there it is two bleary-eyed hours’ drive around to Badwater. Arriving well after dark, we quickly made dinner, set the alarm for a painful hour, and crashed at the non-camping non-trailhead, which was surprisingly chilly for being 282 feet below sea level. Mine was the only car in the lot at North Lake, and the pack station and campground were both long closed. I woke to my alarm at 4:00 AM, and started the lonely walk up the road through the campground at 4:30. 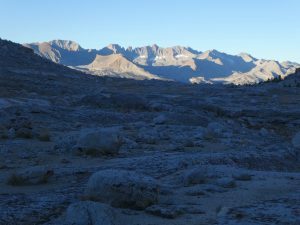 The route to Lamarck Col is much easier to follow now than when I first used it, with signs of recent trailwork, and I am much more familiar with the route, so I had no trouble making my way up to the upper sand-slope by headlamp. I can’t say that I enjoy this approach, but it is far from my least favorite on the east side. 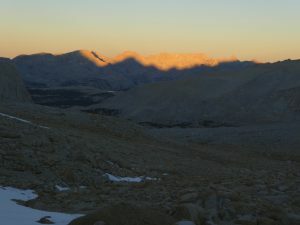 I reached the col about 2 hours from the car, a good time for me considering that I had walked the road to the trailhead, and admired the sunrise on Gould, Mendel, and Darwin for a minute before dropping down the mess of trails through the sand and boulders to Darwin Bench. 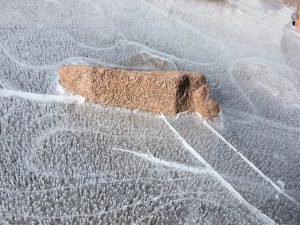 It was cold and windy on the bench, and the windblown surf on one of the lakes had frozen on the sandy shore overnight. 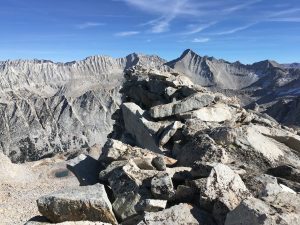 I wanted to get out of there, so I made pretty good time, reaching the JMT in 3 hours. It was warmer down in Evolution Valley, where I took off my overshirt and switched to daytime mode. 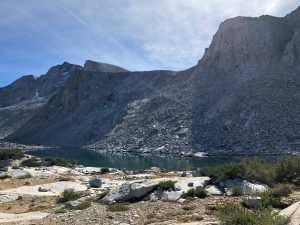 I hiked up the empty JMT to Evolution Lake, then hopped across its outlet on some rocks and began a traverse around the head of Evolution Valley toward the Hermit’s east face. The traverse started out with some slightly tricky slabs, then became an easy mix of slab and forest, with a couple of cairns possibly marking some sort of route. The terrain remained easy to the flat spot below the Hermit’s two summits around 11,400′. Above, I followed a diagonal gully to join the main garbage chute which drops from the saddle between the two summits. The climbing was mildly unpleasant, but there were enough solid rocks that I could mostly avoid thrashing up the loose stuff. From the saddle, I had a good view of McGee Creek and Peter Peak, which I planned to visit later in the day. 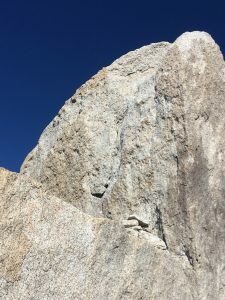 I made my way up some class 2-3 terrain on the sunny side of the ridge, and soon reached the Hermit’s famous summit block, one of the hardest on the SPS list. There are two ways to do it: a 20-30-foot offwidth/lieback on the east side, and a harder 10-foot face on the south. I had wanted to bring the short piece of rope I used on Thunderbolt to aid this block, but I couldn’t find it in my car the night before. Instead, I brought my rock shoes and hoped for a miracle of skill and confidence. 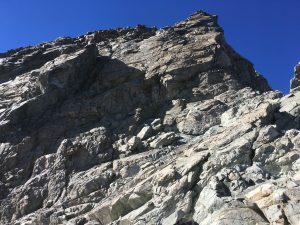 As Chernomyrdin said, “I was hoping for the best, but it turned out as it always does.” I started with the short south side, where previous climbers had built a pile of rocks to ease the start. I found a small left foot and a good left hand, and got a solid right foot, and was basically one move from topping out. However, I couldn’t find anything I liked above that: I needed something for my right hand, and the options seemed to be either grabbing one of the crumbly nubs, or palming the rounded right edge. After one half-hearted lunge where I popped off and stuck the landing, I decided that I had had enough. 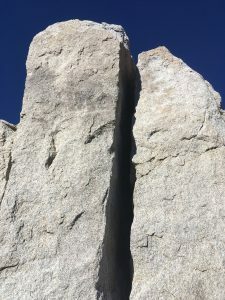 I liebacked up the east crack for a few moves, and it felt great, but I wasn’t confident that my strength would last to the top, and it would not be easy to shove myself into the offwidth and rest partway up. I clearly need to climb more. After wasting too much time getting shut down, I put my rock shoes back in my pack and returned to the saddle. I descended the loose chute on its west side for a bit, then traversed south to the lake at its base. Along the way, I somehow managed to dislodge a small rock which cut my finger on its way downhill. I got water and rinsed my finger at the lake, then climbed over the minor ridge to McGee Lakes, where the Park Service was killing non-native fish with a gill net. I started up the easy slabs of McGee’s northeast ridge, familiar from one of my one-handed backpacking trips. I was feeling a bit slow, but managed a respectable pace considering the mileage I have put on my body in the past two weeks. 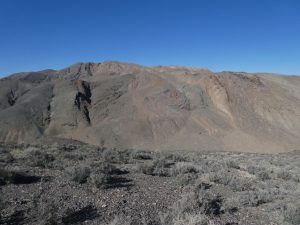 Where the northeast and southeast ridges meet, the rock changes to the loose volcanic crap found on neighboring Goddard. A bit light-headed from the effort, I slipped and somehow cut my wrist on a boulder, continuing the day’s blood-letting. 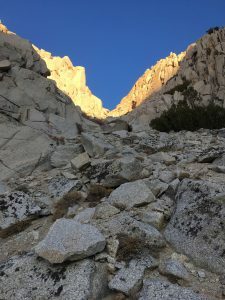 With a bit of third class climbing, I reached McGee’s east summit, and was once again faced with the headwall that had turned back one-handed me a few years ago. The descent to the notch was miserable, careful climbing on rotten rock or loose talus on the south side. From there, more third class led up some white rock to the base of the black face. The route was obvious, a right-facing dihedral with a crack in the back. I approached with some trepidation, as Bob had rated it 5.6, which is close to the limit of what I can solo. However, his trip report had also said that it felt secure, and I agreed. 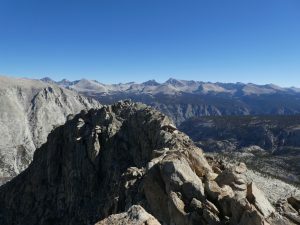 There were ample holds and opportunities to stem and jam, so while the climb was steep, it was not strenuous, so I had a good time making my way back to the sun at the top of the pillar. I would rate it maybe 5.4. Above, more class 3-4 climbing led to the long-sought-after summit. There were surprisingly few visitors in the register, most of them familiar. 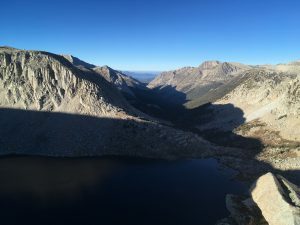 To the east and south, I had spectacular views of the Evolution ridge, Palisades, Davis Lakes, and Goddard. To the west, I saw a surprising amount of smoke, either from the Alder, Mountaineer, and Moses Fires, or just because the Central Valley is a terrible place. 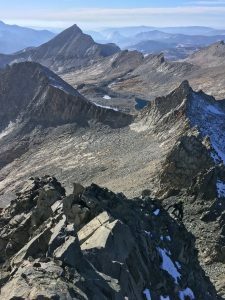 The easiest way off McGee is to drop to the saddle between its main and west summits, then take a loose chute south to Davis Lakes. However, this would leave me a long way from North Lake. Instead, I followed Bob’s route, traversing to Peter Peak and dropping to McGee Creek. 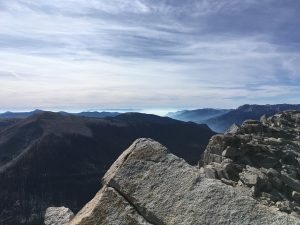 I made another loose descent, then climbed some third class to the west summit, from which I could examine the rest of the traverse. It looked like an easy boulder-hop, but turned out to be loose and miserable, with plenty of large “surprise surfboard” blocks. The climb to Peter was easier than the descent. 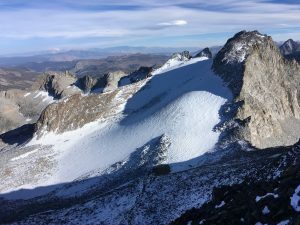 I had entertained the thought of continuing to Emerald Peak, an SPS peak at the northwest end of the ridge, but it looked like there was a tricky section just past Peter, then much more of the same wretchedness going over the two subpeaks along the way. Following Bob’s route, I dropped down the east side of the summit, then followed a loose gully to the moraine at the base of the ridge. Along the way, I managed to slip on a surfboard and bash my knee in exactly the same place I had on the way back from Picket Guard. Joy. 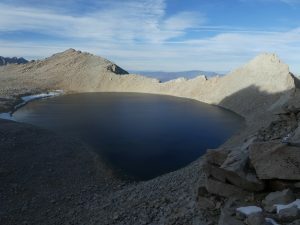 When Bob had visited, there had been a snow tongue leading through the moraine to the easier ground below McGee Lakes. Unfortunately, no snow was left for me this late in the year, so I cautiously picked my way through loose boulders instead. I felt pretty good jogging down McGee Creek, easily picking up the faint trail on the west side of the creek. 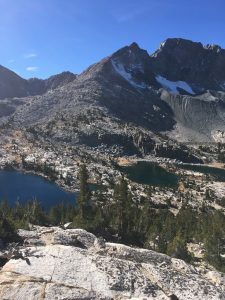 I felt slow on the climb up the JMT and the use trail to Darwin Bench, but somehow found the energy to jog the flats on the Bench and past the Darwin Canyon lakes. 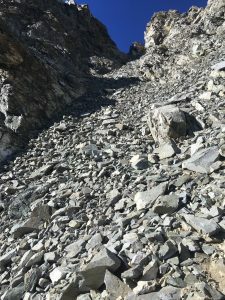 I ground out the 1000-foot climb to Lamarck Col, pausing in a sheltered spot on the sunny side to put on my overshirt, hat, gloves, and angry music, then charged over the col. After a careful descent of the snowfield, I ran most of the descent, tired but wanting to reach the car before headlamp time. I jogged right through the trailhead, finally slowing to a walk at the pack station turnoff. It was still warm and light enough to comfortably rinse off my feet before driving down to the valley to interact with the humans and sleep. 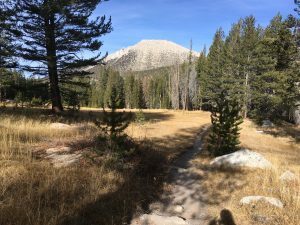 Florence is a remote peak in southern Yosemite, located west of Lyell and Maclure, and not particularly close to any trail. Leor Pantilat had done a loop including Florence a few years ago, and it had been kicking around in the back of my head ever since. 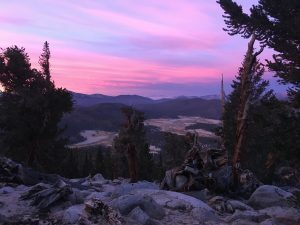 Circumstances were finally right this year, so I found myself camping at the Mobil station in Lee Vining, then driving up the road into the park at sunrise, not wanting to start too early at the always-cold Tuolomne Meadows. Leor, doing it early in the season, probably chose to go up the Lyell in the morning to avoid mid-day heat. Doing it late in the year, it made more sense to go the other way, jogging down the Lyell in the evening. Birds sufficiently photographed, we continued over the pass, dropping down into Lewis Creek. The goal is to leave the descending trail at some point to traverse into Florence Creek just below Florence Lake. I chose a semi-arbitrary point, and found mostly easy cross-country travel and a short boulder-hop leading into the valley. 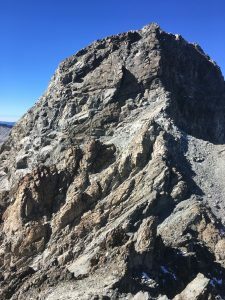 Florence’s west ridge is mostly sheer on its north side, but there is a talus-field leading to a saddle behind Lake 10,451′. The shady climb was chilly, but thankfully the mix of slabs and stable talus was mostly snow-free. Emerging on the ridge, I was surprised to see a wildlife camera attached to one boulder; perhaps this col is popular with bighorn sheep, too. From there, a steady climb up sand and boulders leads to Florence’s summit. To the west, the Cathedral Range rises from Simmons to Maclure and Lyell at its southern end. Southwest of its spine is the barren, slabby flat of upper Hutchings Creek. We signed the register, then continued down Florence’s blocky south ridge. The easiest route would have followed the ridge to a saddle, but for some reason I chose to drop down a loose chute. There was a bit of good sand-skiing at the bottom, but not enough to make up for the hijinks higher up. Maclure’s west ridge looks complicated, so the best route contours around Point 12,358′, past upper Hutchings Lake, then does… something. 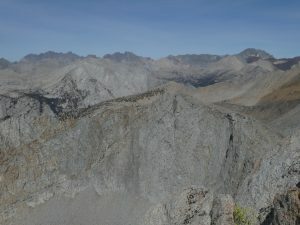 The ridge between Maclure Lyell is sheer between the two peaks, but can be gained either just west of Maclure or at a saddle on Lyell’s southwest ridge. I was tempted by the latter, but the days are short and it was getting late, so it seemed best to head straight for Maclure and home. The climb to the ridge looked miserable from afar, but was actually fairly efficient, following a slot through a lower cliff-band, then climbing slabs and fairly stable talus. Once on the ridge, things became less pleasant. The crest is made of some chossy black rock, and north-facing aspects were holding snow that would not melt until spring. 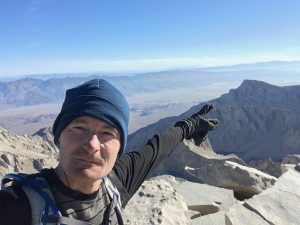 I climbed some class 3 rock to the crest, did a bit of sketchy and partially snow-covered climbing on the north, then emerged on the narrow ridge 50 yards short of the summit. I dug out the register, then retreated to a sheltered spot to add my name and look for my previous entry. It was cold and windy, and the descent was unpleasantly north-facing and snowy, so we wasted little time on the summit before taking the ridge toward Lyell, then dropping down the boulder-field west of the dead Lyell Glacier. 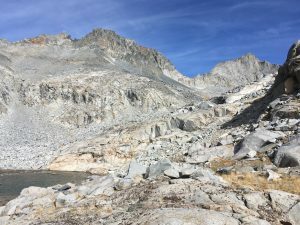 Below the glacier, we finally found easy travel down the head of Lyell Canyon on slabs and grass, with a faint use trail from time to time, and eventually reached the JMT below Donohue Pass. The trail starts with an annoyingly stair-stepped descent from 10,500′ to the flat part of the canyon at 9000′. From there, it descends a mere 300′ over 8 miles to the crossing of the Lyell fork. This was supposed to be the fast, cruising end of the day, but it was slow going on tired legs, and our late start meant generous headlamp time. However, the stars were clear with no moon, and the temperatures were comfortable, so I didn’t mind the nighttime commute. We drove back to the Mobil while warming up leftover burrito in front of the heater, then I slept again at my scenic spot overlooking Mono Lake. 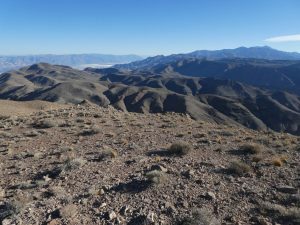 Mount Guyot is an unremarkable mound of sand and talus lying southeast of the Kaweahs across the deep Kern River valley. 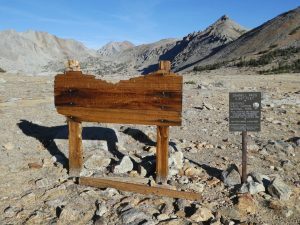 It is usually reached out of the high Horseshoe Meadows trailhead via Cottonwood Pass and the Pacific Crest Trail, a 30-mile round-trip hike with not too much elevation gain. 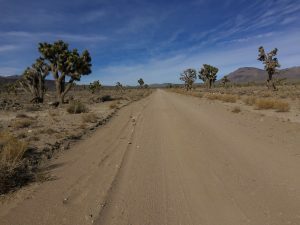 I was already in the Lone Pine area and looking for a medium-difficulty outing, and the Horseshoe Meadows road was still open, so I decided to take advantage of it. I sketched out three options: Kern Peak, Muah and Cartago, and Guyot, then headed up the road to sleep on my decision. I woke to my 4:30 alarm, and was groggily confused for a minute when my phone said it was 3:30. I belatedly remembered the time change, then pretended to sleep a bit more before finally starting around 5:00 PST. I had done Cottonwood Pass twice before, and its sand and horizontal switchbacks sucked this time as much as the last two, but at least I got to do most of it in the dark. 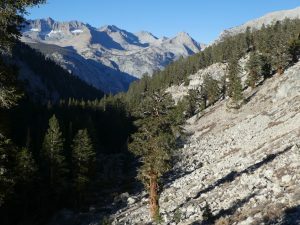 Beyond the pass, the trail makes a near-level traverse around Cirque Peak in a sandy trench before entering Rock Creek. I had been to the upper Rock Creek crossing to do Joe Devel and its neighbors many years ago, but the lower crossing was new to me, and I had a sinking feeling as I hiked and jogged from 11,200′ down to the creek at 9600′. Despite the perfect conditions, there aren’t many people out in the high country now, so I was surprised to see someone coming up the trail toward me, and even more so to realize that it was Robert! Oddly, he seemed to half-expect me to be out in the area. We talked for awhile, then I continued, glad to have randomly chosen this hike among my three options. From Rock Creek, the trail switchbacks up the north side, then continues along Guyot Creek to the saddle between Guyot and Chamberlain. I left it somewhere on the flat before the pass, angling for Guyot’s northeast ridge. The slope looked miserably sandy from below, but there were enough boulders to offer solid footing for most of the climb. I had been sweating in a t-shirt on the south-facing slope, so I welcomed the breeze when I finally reached the ridge. I stayed on or right of the crest on the climb to the summit crags, finding the occasional recent footprint. Guyot has several possible summit rocks, so of course the highest is the farthest away. I grabbed the register can, then sat out of the wind on the sunny south side to peruse the recent entries and have a sandwich. As expected, I noticed Robert from earlier in the day, and Iris (who Robert had told me was backpacking the area’s peaks) from the day before. I finished my sandwich, then descended the ridge a ways before dropping down the face. I avoided the rocks this time, enjoying the sand between them on my way back to the trail. 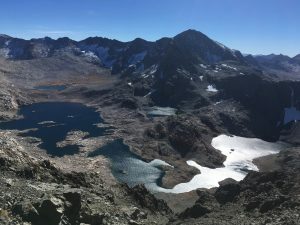 I stopped to dump the sand out of my shoes, then hiked and jogged back down to Rock Creek, dreading the climb back to Cottonwood Pass. Nearing the creek crossing, I saw a familiar figure sitting on the bear box, and startled her with a loud “Hi, Iris!” I had another early start planned for the next day, but chose company over speed for the slog back to Horseshoe Meadows. We traded packs, then took off through the woods on the gradual switchbacks and meandering trail. Lively conversation made the long sand-slog pass much less painfully. 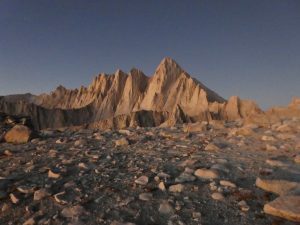 A short distance down the other side of the pass, I looked at my watch and the sun, and realized that I needed to hurry in order to get ready and get enough sleep for the next day. I gave Iris back her overnight pack, then took off jogging down the horizontal switchbacks. I soon got frustrated, and cut directly down the open, sandy slope to the base. 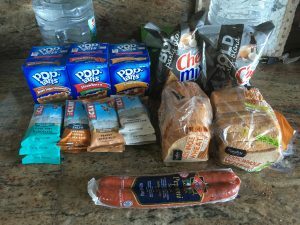 With a bit of jogging, I reached the trailhead about 12 hours after starting, then drove north into the night to make some more sandwiches before crashing at the next trailhead. Picket Guard is an obscure peak northeast of the Kaweahs, and one of the most remote SPS peaks. 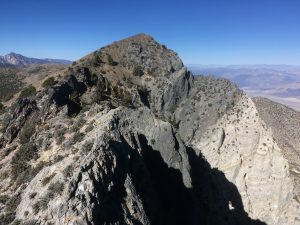 Like its neighbor Kern Point, it is blocked from the east by the deep Kern valley, and from the west by the high Kaweahs and Great Western Divide (and lots of miles). 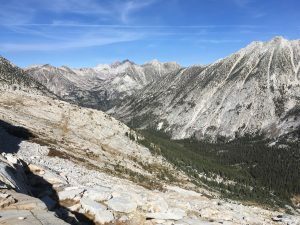 It has previously been dayhiked in a number of ways: Bob did it from Mineral King to the west, Matthew from Whitney Portal via Trail Crest, and Matt via Shepherd Pass. 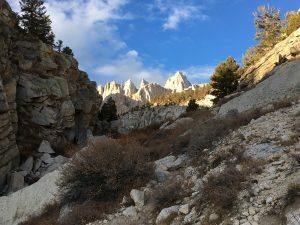 I chose a slightly shorter approach with more cross-country, going from Whitney Portal over Russell-Carillon Col and down Wallace Creek. This involves about 35 miles and 15,000′ of gain, which, with a fair amount of running, took me 13h20. The days are punishingly short now, but the weather continues to be pleasant in the high country. 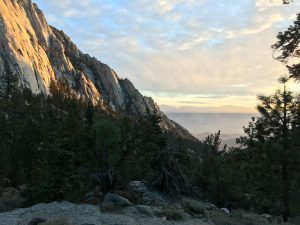 I woke to my 4:00 alarm at Whitney Portal, then joined the 4:30 headlamp parade. Even on a weekday at this time of year, there are regular waves of people getting pre-dawn starts to hike the Whitney trail… I mostly avoided them by taking the old trail, then continuing up the North Fork trail. I passed one pair a short ways up, probably headed for the Mountaineers Route since they were not carrying ropes, moving fast enough that they had no reason to start by headlamp. I had forgotten how much of a slog it is to Russell-Carillon Col, and it is somewhat worse in the dark, when you cannot pick the best trail. I grimly slid and plodded up various use trails, finally stowing my headlamp at the broad plain below the two peaks. 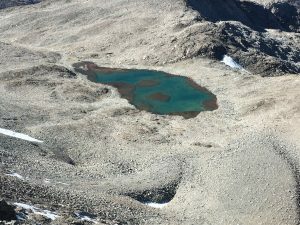 Dropping over the Col, I was surprised to find almost no snow on the north side, and no ice on Tulainyo Lake. I have visited Wallace Creek several times, and always enjoy the easy cross-country travel and excellent views of nearby peaks like Carl Heller, and the more distant Great Western Divide. I picked up the old trail near Wallace Lake, which is faint in places and boggy early in the season. 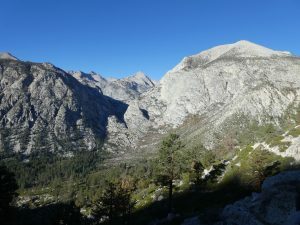 It was completely dry now, and I followed cairns and intermittent trail on the long hike/jog down to the JMT. Using this route, I reached it in only about 10 miles, versus something closer to 20 if I had taken the Whitney trail over Trail Crest. 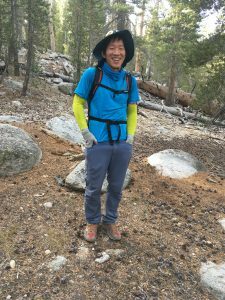 Back on trail, I jogged the descent along Wallace Creek, then put on some Ministry and bombed down the perfectly runnable trail into the Kern, sprinting past two surprised backpackers on my way to Junction Meadow. It was already warm down here around 8000′, and I dreaded the hot climb back out on my return. 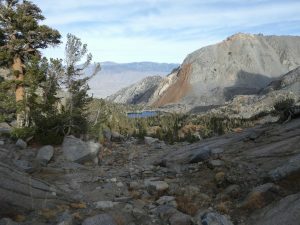 I easily crossed the “mighty” Kern, grabbing some water along the way, then continued up the new-to-me Colby Pass trail. The lower part passes through some nasty manzanita and buckthorn, which had only partly been cleared, making me glad I had long pants. 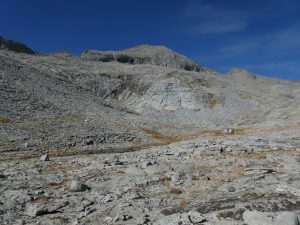 Since Colby Pass connects two places almost no one visits, the lower Kern and Cloud Canyon, it does not see much traffic. However, it is still maintained, as shown by the brush-clearing and some cut aspens higher up. I had stupidly forgotten to download the relevant maps to my phone, so I was guided by an orange line on a gray background, representing the route I had sketched in CalTopo the day before. 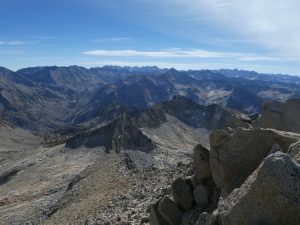 I left the trail about where that line turned left, easily crossed the trickle of the Kings-Kern, and after a few class 3 moves, made my way up pleasant class 3 slabs toward the toe of Picket Guard’s east ridge. Someone on SummitPost had mentioned traces of an old trail in this area, but I saw nothing, and felt no need of it. I eventually emerged on the seldom-visited plain east of the Kaweahs near the easternmost Picket Lake. 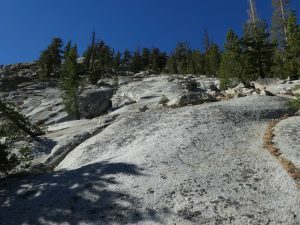 From there, I regained the broad east ridge, then made a long, steady climb through open forest, then a mix of slabs, boulders, and a bit of sand. After a bit of class 3 poking around, I found the apparent highpoint and register canister, just over 7 hours after I had started. The register was a fine Smatko relic from the 1960s, with most of the recent entries being from the usual suspects. I spent some time admiring Triple Divide Peak and the Kaweahs, but also the plain to the south. As far as I know, this is the most remote part of the whole Sierra, far from roads and trails, and not on the way to any destination. If I wanted to live in an illegal cabin in the range, this is where I would build it. Looking across the deep Kern at Wallace Creek and the distant backside of Whitney reminded me of how much work I had left. 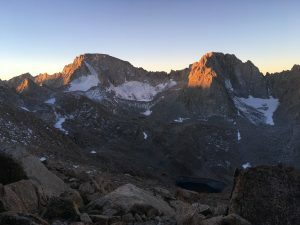 I hopped back down the ridge, jogged the runnable parts of the Colby Pass trail, then grabbed more water at the Kern and began the long, gradual climb to Russell-Carillon Col. I felt surprisingly energetic on the lower climb, jogging some of the gentler sections and fast-walking the rest. My sprightliness continued past the JMT, and I jogged many flatter sections of the old trail up Wallace Creek. 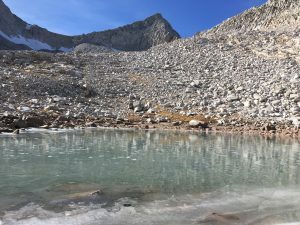 I finally started slowing down on the headwall above Wallace Lake, climbing the boulders above the partly-frozen stream, then hiking to the saddle near Tulainyo Lake. I was really dragging on the final steep climb to the col, but made it in time to get a nice view of the large and unusual lake in the late afternoon light. It was all easy cruising from there, across the sandy plateau, then down the use trails to Upper Boy Scout Lake (much easier in daylight), and along the North Fork trail. I somehow managed to screw it up, first falling when a rock rolled on me in the treacherous section just below Lower Boy Scout Lake, then doing some thrashing when I tried to take one of the “shortcuts” I (mis-)remembered lower down. Still, I was back at the car before dark, where I quickly rinsed off in the creek, then headed into town to forage. I am getting close enough to finishing the SPS list (213/248) that I am tempted to tag the remaining remote and/or lame peaks. Pyramid is one of the former, located in an inaccessible part of the range west of Perkins and Colosseum. Bob had done it from the west, starting at Kanawyers and coming up Woods Creek from the bottom. However, I hate driving around to the west side, and perversely wanted to use Sawmill Pass, the last big east-side pass I had not summited. Sawmill has the lowest trailhead, at 4500′, and climbs 6800′ in 9 miles to the crest. The bottom 2000′ are sand, and miserably hot in the summer. However, it is pleasantly cool this time of year, and those 2000′ of sand are a joy to descend. I got started around 5:00, opting for almost 2 hours of morning headlamp on a short fall day. It was chilly enough to be wearing an overshirt, hat and gloves even going fairly hard up the sandy climb. The trail climbs a ridge north of the lower slot canyon, then makes a rolling traverse around some rock outcroppings to reach the stream. 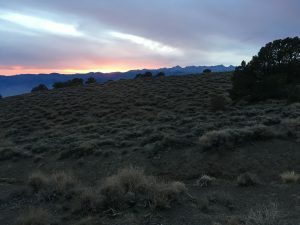 I finally turned off my headlamp somewhere in the wooded switchbacks, and admired the sunrise on Sawmill Point as I climbed the Hogsback, which may be an old medial moraine between two branches of Sawmill Canyon. 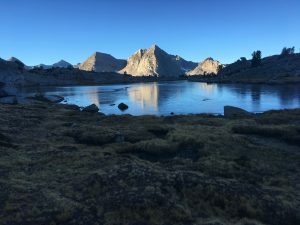 I passed Sawmill Lake, where we had left the trail to climb Indian Point during the Sierra Challenge, then was surprised at the distance to the pass. I finally reached it after four hours of work, half-way to my destination and still unable to see it. The “unmaintained” Sawmill Pass trail had seen recent maintenance on the east side, where some large trees had been sawed through recently. However, it is in much worse shape on the west side, occasionally reduced to a mere line of cairns as it crosses the grassy bogs past Woods Lake. 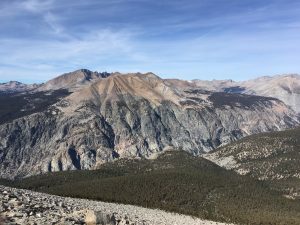 1000′ down from the pass, I reached the JMT behind Mount Cedric Wright, and began jogging down the broad valley of upper Woods Creek around Crater’s south side. Just past the White Fork, I headed uphill toward the barely-flowing Window Creek. I had long wanted to visit this remote drainage, where experienced ranger Randy Morgenson had drowned, possibly when a snow bridge collapsed. When I finally found Window Creek, I could understand why: the creek flows through a narrow gorge in most places. While I could easily walk up the gorge next to the small late-season trickle of water, the gorge would hold snow well into the season, and walking up that snow would be the quickest way through the valley. 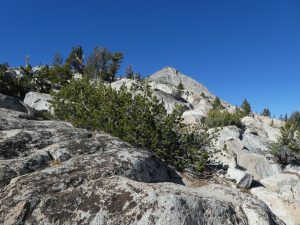 One normally finds some signs of human traffic in trail-less sections of the Sierra, whether an old fire ring, a faint use trail, or a flat spot for a tent. However, I saw none of these as I made my way up-valley; like Dumbbell Basin, the place was wonderfully free of human signs. Nearing Window Lake, I finally got a glimpse of Pyramid, and of the ridge connecting it to Window. I hoped to do both, but it looked potentially involved, with cliffs along its base blocking easy escape. 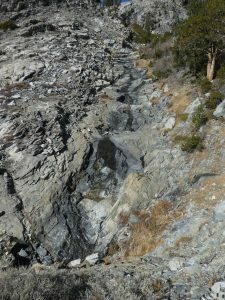 I continued up the streambed, then left it east of the saddle south of Pyramid to hike up some easy slabs. A bit of a scramble got me to the upper talus-face, where I made an ascending traverse to the summit. There was no register canister, just a lid, but amazingly the booklet wrapped in plastic bags had survived a couple of years. I added my name, re-wrapped it in bags, and tried to protect it with the lid as best I could. The ridge to Window looked tricky, and some people I know had written in the register that it was 5.6. I suppose I could have tried, but it had taken me 7h40 to reach Pyramid, and I decided I would rather try to make it home by dark than play around on serious, remote terrain. 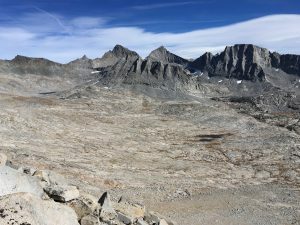 I retraced my route, eating my second-to-last sandwich before the grind back up the JMT, and my last partway to Sawmill Pass. 6800 feet and nine miles of descent is no joke, but Sawmill was mostly as pleasant as I remembered. The top part is a bit rocky, but much better than neighboring Taboose. The switchbacks between Sawmill Lake and Meadow dragged on a bit, but from the meadow on was almost all a blast. The part along the creek is soft leaves and pine duff, with a good grade and not too many switchbacks. After some suckage traversing out of the creekbed, the final sand descent is pure awesome, soft sand and a perfect grade to really open up. (Wear long pants, though — without them, the buckthorn will make you pay!) A final hike through a couple of ravines in the desert got me back to the car with enough time to wash up without my headlamp. This mission had been more fun and taken less time than I anticipated; it was a good day.